What would you do if you adopted a dog that tore apart your house on a regular occasion? Would you take him back? That was the decision Charmaine and Chris Hammond had to face after they adopted Toby, a five-year-old Chesapeake Bay Retriever. Broken toilet tank lids, torn-apart closets, shelves emptied and, strangely enough, sitting in the bathroom sink were just some of the behaviors Toby would display after being left alone. He seemed well-trained at first but his antics soon escalated to beyond belief. It was an incident with a knife-block that set this family on a journey of discovery. Toby has everything a dog could want, a good home, caring parents, a large back yard and a doggy-door leading into it. Well-behaved most of the time, he would randomly act out and destroy any trust that he had built up with his owners. Obedience training worked up to a point but the journey to calming this dog down leads them down paths they never considered before. 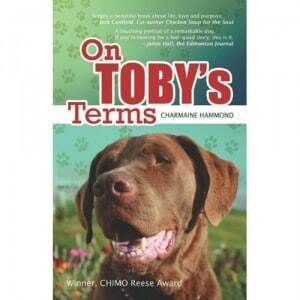 Charmaine Hammond’s love for her dog shines through in her stories about Toby and their adventures in finding a purpose for this friendly, gentle and crazy dog. As the owner of a dog with a few quirks of her own, I definitely understood a small part of what they went through with Toby. Not that I ever had to buy toilet tank lids in bulk! Buy this book for the dog-lover on your Christmas list! My favorite product on Open Sky is the Happy Hippy Bracelet for $45.00. I love reading animal stories.